The more wealth concentrates, the greater the strain on our biosphere. Top environmentalists get that connection. Now our societies must. 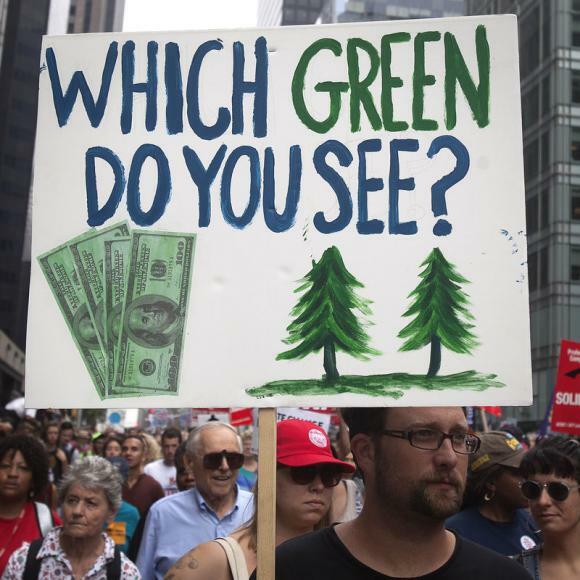 A scene from the 400,000-strong People’s Climate March earlier this month in New York. What is it going to take to save the planet from environmental devastation? Sheer people power? We certainly saw that on the eve of last week’s UN Climate Summit in New York. Some 400,000 marchers packed the streets of Manhattan. Millions more rallied the same day in over 2,600 other actions in 162 countries. Or can simple shaming get world leaders to start seriously addressing the climate change challenge? We saw some serious shaming last week, too. Spoken-word poet Kathy Jetnil-Kijiner from the Marshall Islands — the nation climate change most immediately endangers — helped open Tuesday’s UN summit with an open letter to her baby daughter that reportedly brought many of the 120 world leaders present to tears. People have been entertaining hopes along that line, British commentator George Monbiot has observed, ever since world leaders first started gathering for environmental summits back in 1992. Activists are linking the increasing degradation of our global environment and the increasing concentration of our global wealth. Why should that be the case? 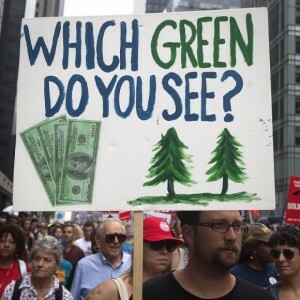 Over recent decades, analysts and activists have made all sorts of links between the increasing degradation of our global environment and the increasing concentration of our global wealth. The super rich, for starters, stomp out a huge carbon footprint. The best symbol of this stomping? That may be the private jet. These high-powered playthings of the global elite emit six times more carbon per passenger than normal commercial jets. Between 1970 and 2006, the number of private jets worldwide multiplied by ten times over. The super rich don’t just consume at rates that dwarf the consumption of mere financial mortals. Their profligate spending stimulates endless consumption all the way down the economic ladder. The super rich stimulate endless consumption all the way down the economic ladder. In more equal societies, analysts note, most people can afford the same things. In that environment, things don’t matter all that much. But things become a powerful marker of social status in unequal societies where most people can’t afford the same things. In these societies, you either accumulate more and bigger things or find yourself labeled a failure. Firms with worker representatives on their governing boards, employee-owned companies, and co-op enterprises “typically have much smaller pay differences within them,” note Wilkinson and Pickett, the authors of the landmark bestseller The Spirit Level: Why More Equal Societies Almost Always Do Better. We also need to work together, suggests Boston College sociologist Juliet Schor, to start evolving the “community provisioning of basic needs,” through, for instance, publicly owned utilities that provide households power and heat at sustainably reasonable prices. In nations where wealth concentrates the most severely, the wealthy wield their political power to derail environmental reforms. All this working together won’t be easy. People, at some level, are going to have to trust each other, notes Bill Kerry of the UK’s Equality Trust. But inequality undercuts trust. The more unequal a society, research has shown, the less trust within it. The less democracy as well. In nations where income and wealth concentrate the most severely, the wealthy can wield their wildly disproportionate political power to derail the environmental reforms that threaten their gravy trains. Energy company CEOs, for instance, can squelch limits on carbon emissions that endanger their corporate profits — and personal rewards. The wealthy can also employ their wealth to end run sane resource policies that do make it into effect. In drought-ravaged California, for instance, wealthy landowners in Montecito, news reports relate, have been “paying more than ten times the going rate for water” to sidestep new local water use limits. These wealthy landowners are having water trucked in from private wells elsewhere in the state “in a desperate bid to save their manicured lawns and towering topiary.” The trucks are destroying local roads. Other Montecito affluents are rushing to drill private wells on their own property — at $100,000 a pop — that could eventually empty local aquifers. The struggle against environmental degradation and for greater equality, in short, need to go hand in hand. A deeply unequal globe can never be sustainable. The “greenest” major city on Earth, Oslo, doesn’t just happen to sit in Norway, one of the world’s most equal nations. Sam Pizzigati edits Too Much, the Institute for Policy Studies online weekly on excess and inequality. His latest book: The Rich Don’t Always Win: The Forgotten Triumph over Plutocracy that Created the American Middle Class (Seven Stories Press).